The Gallagher family is losing a key member. Emmy Rossum took to Facebook to announce the upcoming season of Shameless, season nine, would be her last. In a lengthy and emotional note, Rossum praised her TV family for becoming just that: a family. "See, in real life, unlike Fiona, I'm an only child. I never had a big family. Being ensconced in that messy Gallagher family love is something I'd always dreamed of. But even off set, it feels real. We've watched the kids grow up into the strong, talented, independent human beings that they are. I taught Emma to shave her legs. I was there when Ethan learned to drive. Shanola and Jeremy and Joan and Bill danced at my wedding in New York last year. Our fearless leader John Wells thankfully held Sam and me up on those rickety chairs during the hora. I've spent the Jewish holy days in temple with David Nevins and his wonderful wife and kids. It really feels like a family," she wrote. Emmy Rossum Says Goodbye to "Shameless"
"I know you will continue on without me, for now. There is much more Gallagher story to be told. I will always be rooting for my family. Try not to think of me as gone, just think of me as moving down the block," she ended her post. "With love, always." But why is she leaving the show? According to a source, Rossum has no plans to take a break from acting. Close friends say she's leaving for strictly professional reasons, and as her note said, she loves and adores everyone on set. Rossum, who has played Fiona Gallagher since the start of Showtime series in 2011, is ready for new roles that challenge her as an actress, particularly on the big screen, our source said. This wasn't a hard decision, but it was a recent one for Rossum, we're told. She never expected the show to last as long as it has, nor did she ever plan to leave before it finished its run, but now that she is departing, she's leaving the show with nothing but positive thoughts. "Emmy Rossum will forever be part of the Shameless family. She has been integral to the show's success, from her wonderful portrayal of Fiona to her leadership role on set, as well as directing multiple episodes of the series. We are hard at work now creating a season nine finale for Shameless which we hope will provide a Gallagher-worthy sendoff for Fiona that honors the great work Emmy has done. It is always bittersweet when an ensemble member decides to move out of the proverbial house, but our door will always remain open for Fiona to return home for a visit, or to move back in. I look forward to continuing the stories of this wildly unpredictable family and all of us on Shameless will miss Emmy and her wonderful Fiona," executive producer and showrunner John Wells said in a statement. In her goodbye note, Rossum praised her character. "The opportunity to play Fiona has been a gift. There are few characters — female or otherwise — as layered and dynamic. She is a mother lion, fierce, flawed and sexually liberated. She is injured, vulnerable, but will never give up. She is living in an economic depression, but refuses to be depressed," she said. "She is resourceful. She is loyal. She is brave. I knew it the second I read the pilot script, this was different, this was special. I tirelessly prepped the audition with my coach Terry Knickerbocker. I walked to the appointment in the rain so I looked disheveled. During my third audition, when I got the part IN the room, I literally jumped up and down screaming in joyous relief and disbelief. Quite simply, the last eight years have been the best of my life." 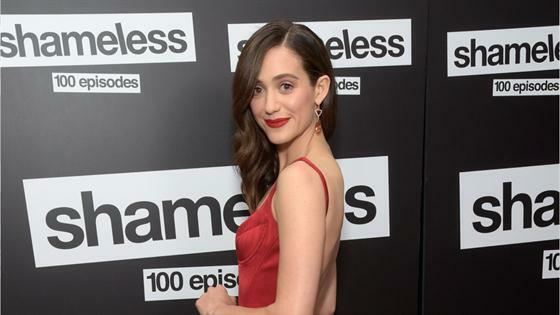 Emmy Rossum Leaving Shameless: "I Know You Will Continue on Without Me"
Gary Levine, president of programming at Showtime Networks, praised Rossum's "inspired work." "We were saddened when Emmy Rossum let us know that the upcoming ninth season of Shameless would be her last. But we are filled with an overwhelming sense of joy and gratitude for Emmy's inspired work on our series, of course in front of the camera but also behind it. Fiona Gallagher will always be one of Showtime's iconic characters, and we applaud Emmy for bringing this character to life in such a natural, touching and fearless performance," Levine said in a statement. "On behalf of everyone at Showtime and her millions of fans, we thank you Emmy!" Shameless returns for season nine on Sunday, Sept. 9 at 9 p.m. on Showtime. Read Rossum's full note on her Facebook.